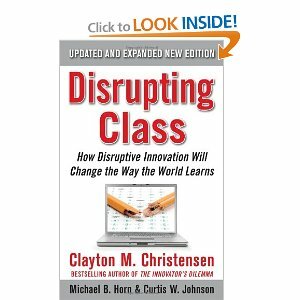 Disrupting Class is Clayton Christensen’s application of disruptive innovation theory, to the problems we see in education. There are global references to scope, but this book speaks directly to the US experience. It offers startling and bold predictions on how guided, student-centered technologies and facilitated networks will alter the way our children are taught, and will learn, in the near and distant future. The future is student-centered education rather than the monolithic teacher-led classroom approach. In the coming years we will flip the classroom. Christensen presents theory as fact, as if he and his cohort are just describing what is about to happen, and it’s possible that he is right. The predictions ride on research and experience from other sectors, and resonate as plausible, possibly even probable. In short, the vision painted by Disrupting Class seems viable, highly informative, and substantively relevant. Reviews of the work, as one might expect, are mixed. Some find Disrupting Class to be lacking in passion, laced with business jargon, and overly involved with irrelevant cases. The academic POV rarely, if ever, entertains opposing points of view or doubt. Children do not seem to be the centerpiece of the work, but rather components of a large and intriguing intellectual puzzle; that students have different intelligences, the goal is to match intelligences with content in facilitated networks, that flipping the classroom will happen whether school boards and unions agree or not, that in the end power structures will resist but fail, and that new business models, proposed in the final chapters of the book can be useful tools for administrators who seek to make these dreams a reality. Viewed as a step in our grand investigation, rather than a destination, Disrupting Class is a magnificent milestone and significant social landmark. It was picked for inclusion in Write to the Bone because of the brand Clayton Christensen represents, and because innovation is a fundamental tactic for change. Influencers across the nation have acknowledged the work’s authority, and I won’t be an exception. Among endorsers are presidents of teachers associations, advisors to presidents, governors, policy makers, and so on. Whether the reader agrees with all points becomes secondary to the megaphone his ideas represent. If the reader is interested in strategy, and seeks to leverage momentum, this is a must read. I also applaud the clarity of the framework where many don’t seem to get the point. Christensen underscores my own conclusion that facilitated networks will contribute greatly to lifelong learning in every sector. It’s an incredible opportunity for innovators. One has only to review the brief history of Wikipedia and YouTube to recognize how far our networks have come in a short period of time. It took hundreds of years to build the school systems we rely upon, but it may take less than twenty years to reform them. If the book glosses over practical application, so be it. Others fill that gap. What I find so valuable is Christensen’s sense of direction. A paradigm shift is underway. Educators who prioritize improving lives among the traditionally disenfranchised should take note, leverage the trends illustrated in the text, and react appropriately with new strategies and tactics. Christensen acknowledges the role of privilege in a few ways – a nod to intellectual cliques for example. But the analysis of what is needed in education in general does not account for privilege in the way I would have hoped. Missing are the realities that poor and otherwise underprivileged segments face on a daily basis. I would have liked specific mention of how disruptive innovation could be better used at the margins, but that is for others to interpret. The reader should expect to view education through an academic lens. That should not imply more than it says. Not every text covers every subject. In the lens described, where the Harvard Business School and Ivy League earmarks are clearly present, exposition on disruptive innovation is often so prevalent that it, rather than education itself, becomes the centerpiece. Realizing this, reviewers often criticize the work for its choice of cases. Perhaps the author could have found more relevant examples, but in each instance, at least for this reader, the business cases well illustrate points made about how disruptive innovation works. What follows in each instance is a section on how the case is applicable. The reader will not be able to understand the core premise of the work unless he or she grasps the full meaning and implication of disruptive innovation, that it is very nearly a force of nature. Patience with the material is required. It’s also useful to recognize that a degree of give and take is required for cross-sector dialogue. By the way, more of this kind of cross-sector interaction is needed. Understanding the history of how our schools emulate efficiencies achieved in manufacturing, segregate learning into supposedly efficient silos of math, science, English, technology and so forth, shows that cross-sector influence has persisted through time. Having the private sector weigh in on the future of education should be encouraged as long as it does not ultimately rule every decision. Christensen outlines what, in his understanding, we have tasked our schools to do: maximize human potential, perpetuate democracy, hone skills so that students can be successful and we can compete as a nation; and nurture the understanding that “people see things differently – and that those differences merit respect rather than persecution.” Through exposition, he presents the history of education; it’s present state, and what is about to happen, as fact. What is about to happen is disruptive innovation. As described, leadership will have little choice in the matter. Forces like facilitated networks and the enthusiasm and proliferation of new content providers will be no match for the maladaptation of textbook publishers and the approval process that sustains them. They will try but cannot respond efficiently, nor cost effectively. The book also implies that simply attempting to roll new content into the old model will fail. Politically, says Christensen, monolithic structures always resist but cannot ultimately compete. With the exception of a few digressions into business analogies, as mentioned above, Disrupting Class held my attention and informed. Like any thought piece on a comprehensive theory of practice, information is framed using tools at the author’s disposal. As with other publications of it’s type, there is virtually no practicum. The reader seeking specific ideas – after school program ideas, software and other tools to create lesson plans – will have to look elsewhere. For this reason some reviewers give far less credit than is due. The strategy is to take what is useful and search elsewhere for the rest. Here is what I found to be most useful. The author insists that we move toward a student-centric model, that motivation can only be addressed by instilling a daily feeling of success and fun (what I would also call enthusiasm), that we must design models that allow for different intelligences and behaviors in our student populations, and that we must move away from monolithic teacher-lecturer classrooms toward technology powered online learning. Flipping the classroom and other points echo throughout the literature, as I’ve discovered it thus far. Many reviewers were surprised by a bold prediction, that in the near future 50% of classes will be taught with online tools, and that by 2024 that figure will have jumped to 80%. Equally surprising to me was the section on Language Dancing where studies show the incredible advantage children can have, regardless of other life conditions, coming from homes where parents continually speak to their babies in a certain way – language dancing through the first 36 months of life. Whole communities miss this simple fact, perpetuating difficulties with cognitive learning for generations. Though no explicit examples or direction is provided, these research-based observations open the door for imagining new programs. Clayton Christensen is a remarkable brand. He’s worked with many of the most influential corporations in the world and is an esteemed professor in the Harvard Business School. Dr. Christensen is also a valued speaker and determined human being. In the one hour and twenty minute video posted at the end of this review, one year after suffering a stroke, Dr. Christensen is first introduced in an interview and then speaks to leaders in higher education on the future of state universities. Many of the ideas expressed here are illustrated in the video, though the viewer may find it often tedious. Each chapter of Disrupting Class begins with fictional prose, a story written to emulate possible scenarios in the real-world. In my opinion, possibly in the opinion of the writer as well, actual examples from some of the schools mentioned – Q2L, The Met, High Tech High San Diego and so on would have been a better strategy. Time and resources may have been an issue in the initial publishing, but this could have been revised in the second. Also, each chapter incorporates extensive endnotes. They are voluminous, but upon inspection, often lack breadth and specificity. It’s possible that some were offered in support of conclusions already reached, rather than as evidence of discoveries made while conducting research for the book. I very much would like to encounter cases grounded in education in the next edition. Disrupting Class concludes with a summary, and advice to stakeholders – school leaders and elected officials, philanthropy, entrepreneurs, training colleges, graduate schools; and teachers, parents, and students. The strategies outlined represent a viable framework for change and will without doubt influence activities across the nation for years to come. I hope Christensen is right in many respects. I hope we succeed in moving to a student-centric model, train intelligences rather than monolithic blocks, integrate curriculum, and in Christensen’s view; help students find success and fun on a daily basis. Challenges on the path to realizing these outcomes are numerous and tenacious. Many in positions of authority will continue to promote discord over discourse and secumb to confrontation. Students and their schools do not exist in a vacuum. And yet, there seems to be a new track, a bright promise, and cause for hope. Leaders in the margins should immediately see ways to exploit the pending disruption; certainly I have, and I’ll be writing into these ideas as time goes on. The final recommendation is this. Anyone interested in education for themselves, their children; district or campus, should read this book, take from it what resonates in their unique situation, and press forward.